The Miracle Piano Teaching System is a training tool that requires the keyboard peripheral to operate. There's 36 sections (each with 3-15 lessons) and the keyboard features 128 instrument sounds and velocity sensitive keys. Later lessons also task you with using a foot pedal to dampen notes. Aside from the metronome clicks, all noises come from the keyboard itself which allows for a much greater sound range than the NES could handle. Things start off simple (e.g. find all the C keys, divide beats into parts) before eventually moving onto more complex tasks (e.g. playing with two hands, learning different rhythms and time signatures). The training tool does a great job of pacing while being clear and concise. Things do get trickier on Section 6 (especially if you have no knowledge of sheet reading) but it doesn't push you too fast and encourages you to stop and practice what you've learnt. I enjoyed how each lesson slowly builds up through increasing metronome speeds and quizzes before you reach the orchestra; here, you get to play with the Miracle Symphony Orchestra which is strangely exciting and a nice reward for all your hard work! Every time you make a mistake the software classifies it into one of 200 error types; these cleverly determine why you played incorrectly and crucially the game adjusts to give you specific help with that lesson. There's lots of familiar music tracks to jam with, including La Bamba and even the Star Wars theme! 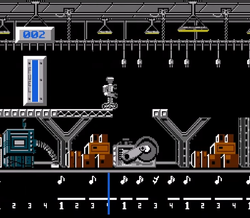 There's also two mini-games including Roboman (press keys when he's directly under power plugs) and Musical Mallards (blast ducks off the staff by hitting the right notes). They're not very imaginative but they do add variety and are moderately entertaining. The Miracle Piano Teaching System is a great learning tool that's welcoming for newcomers and deep enough for professionals. Despite the unconventional format (essentially it's a course wrapped up in an NES cartridge), everything just works and the hefty amount of content will keep you playing for weeks, if not months. Random trivia: The same keyboard can be used for the Amiga, Genesis, Mac, PC and SNES versions as long as you have the right connecting cable.